As people start to pair off in preparation for cuffing season, Tinder, the dating app to rule them all, is making some significant changes to how the app looks and the way it works, releasing a new matching algorithm as well as new profile and messaging features. 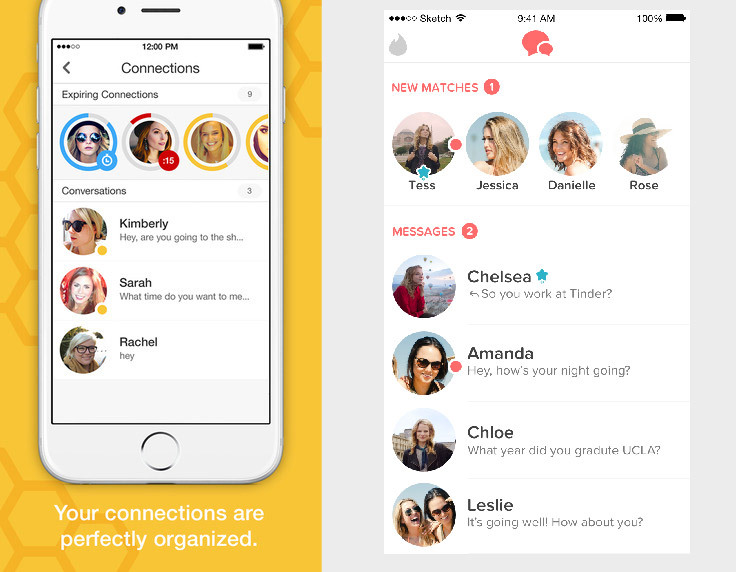 The new algorithm is meant to look at more data points as a user swipes left and right, while the UI changes — a new Matches bar in the inbox and profile data around education and employment — seem to rip a page out of the playbooks of smaller dating apps like Bumble and The League. I hopped on the phone with Tinder CEO and cofounder Sean Rad for some clarity, but he stayed pretty mum on the subject, explaining that “it’s like Google search results” in that whatever is revealed will likely be gamed by people. I asked Rad if the data points added to the new algorithm are simply the addition of employment or education status, or if that includes more technical data points like how many times someone swipes through a particular profile, how long they spend looking at the picture, and whether or not they investigate the user’s Instagram profile. Rad shared that Tinder is adding both technical and informational data points, and that the algorithm change isn’t just about new data points, but how those things are ranked against one another depending on the user. Beyond that, he wouldn’t share anything definitive. Still, one could imagine that Tinder can pay attention to various preferences of their users, such as a user’s propensity to swipe right on girls who like whiskey or guys who use emojis in their profile. As part of the new rollout, which was teased last week, Tinder is also adding the ability for users to include their work and education information. This is all quite standard, as dating apps like Bumble (started by former Tinder VP of Marketing Whitney Wolfe) and The League have always included this type of information at the get-go. Tinder has yet to implement this type of information, perhaps because the idea behind the app was always to be the digital equivalent of meeting eyes across a bar. In that case, you don’t know where the mysterious, beautiful eyes work or where they read books in college, but rather that you’re attracted to them. With these profile points, users will have the opportunity to make more informed decisions, but also may limit how much they swipe based on the more-detailed level of information presented with each potential match. Then again, Tinder doesn’t exactly want you to swipe right too much. The new Tinder is also serving up the most relevant parts of a user’s profile first. For example, if you went to the same school as a prospective match or used to work where they work now, that information will be highlighted on the first page of their profile, right underneath the “calling card” photo. The inbox has always been a bit of a clusterfudge for Tinder, with matches pouring in and conversations starting without any easy way to organize it all. The addition of Moments did nothing to tidy up the place. With the update, users will see their Matches in a swipe-able bar across the top, with circular profile photos and their name below. In matches where users are already communicating, the messaging interface will remain the same on the bottom, showing the most recent conversations in order from top to bottom. It’s impossible to ignore that this format is very similar to Bumble’s messaging interface, save for the fact that Bumble connections expire after 24 hours if a conversation isn’t started. Tinder dominates the space, with almost 10 billion matches since the app launched, and 26 million matches made each day.